Has your power just gone out? Are you standing in the dark after all of your lights and appliances have suddenly shut off? If so, you are probably wondering what the first step is to get your home’s power up and running again. You might also be wondering what caused your power to go out in the first place. Luckily, there is one go-to starting point for getting power back on and assessing the situation: your electrical panel. Otherwise known as a breaker box, your electrical panel houses all of the circuit breakers (or in the case of some older homes, fuses) that control the power supply to the various outlets and large appliances in your home. Circuit breakers are designed to “trip”, or automatically turn off, when a circuit is overloaded. When a circuit breaker trips, the plastic switch automatically flips from its ON position to its middle NEUTRAL or opposite OFF position. When this trip happens, the electrical current in the circuit cuts off to prevent the circuit from overheating and damaging the itself, or other circuits. Sometimes, tripped breakers are caused by external surges in electricity like lightning strikes and electrical company outages. But more often than not, surges are caused by an appliance inside your house that is pulling too much energy from the panel. In the event that you do have a tripped breaker and you’ve lost power in either a certain room or throughout your whole home, you will need to access your breaker box and reset the tripped breaker to restore your home’s power. Warning: there are thousands of volts flowing through a breaker box. Such high voltage could seriously injure someone if improperly handled, therefore, when dealing with high levels of electricity, safety should be a top concern. Don’t take your breaker panel apart. 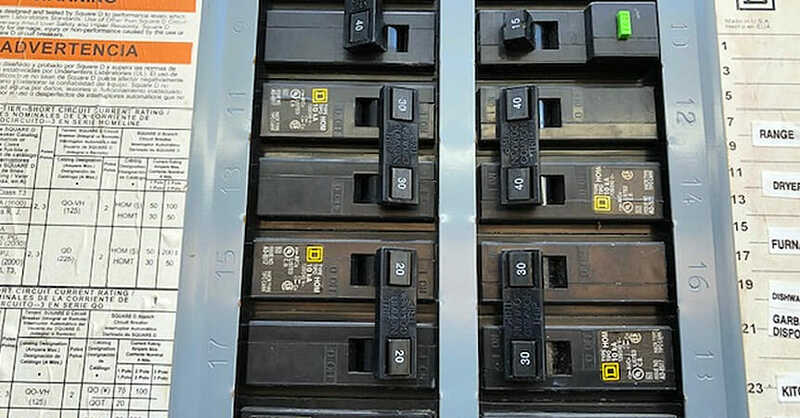 Although it may seem simple, your breaker panel is flowing with a lot of power, and many parts inside of the box can cause electrocution when simply touched. If you ever have problems that cannot be solved by flipping a breaker switch, it is best to call the professionals rather than take apart a breaker panel yourself and risk electrocution. Don’t touch exposed wire or metal parts, only touch plastic switches. There are actually several parts inside your breaker box that are uninsulated and running with a high voltage electrical current. To avoid electric shock, don’t touch anything other than the breaker switches inside your electrical panel. Do stand to the side of the panel when resetting a breaker switch. Sometimes your breaker box can and will spark when you reset a switch, so it is best to stand to the side when resetting and, when possible, wear safety glasses to protect your face and eyes from potential sparking. You may have lost power in part of your house, to a specific appliance like your AC Unit, or throughout your entire home. When any section or single appliance in your house goes out, that means you have a sub breaker trip. When power goes out in your entire home and you find yourself standing in complete silence and darkness, then your main breaker has tripped. Your main breaker controls the power supply to all areas of your house, so when tripped or shut off, it will shut down power to all of the branches and corresponding sub breakers in your electrical system causing a total outage. What Causes a Main Breaker to Trip? Main breaker trips are less common than sub breaker trips, although they do happen. If you find your house has a tripped main breaker and complete power outage, the cause is most likely a result of an outside source of overload like a lightning strike or a power surge that trickled all the way down from the power company. Another less common case of a main breaker trip is when you have a failing sub breaker in your box that gets overloaded. When a circuit with a failing sub breaker gets overloaded, the main breaker will serve as a secondary backup safety feature that will trip to compensate for the overloaded circuit, causing outages across your electrical panel, even in areas that may not seem necessary to shut off. Turn the main breaker switch all the way to the OFF position. Sometimes when a breaker trips, it will shift to a neutral position that is neither far left or far right, but right in the center. Start by making sure your maine break switch is slid all the way to the OFF position. Shut off each individual sub breaker. As mentioned previously, it is best to avoid restoring power to everything all at once after an outage, so to ensure you can meter the restoration of power, turn off each of your sub breakers, too. Turn main breaker back on. It’s as easy as it sounds: switch the main breaker back to the ON position. Incrementally switch each sub breaker back to ON. Follow the main power supply by incrementally switching each sub breaker back on with about 5 seconds between each to ensure a gradual restoration of power to your home and to avoid sudden large demands of power on the main breaker that may cause it to trip again. NOTE: On a tripped breaker, turn the breaker all the way to the OFF position before turning back to the ON position. What Is a Sub Breaker? What Causes Sub Breakers to Trip? Breaker trips are usually caused by devices or appliances inside your house that are pulling too much energy from the circuit, especially when it comes to a tripped individual sub breaker. A tripped sub breaker could mean you have a single old, worn out, or too powerful of an appliance that is the source of all your tripping breakers woes. Otherwise, you may have too many devices, lights, and appliances plugged into a single circuit, and regular surges in the power flow causes your breaker to trip. In less ideal situations, a tripped breaker can sometimes result from a shorted circuit, a ground fault, or damaged wires. If you have ongoing trouble and suspect the problem is in your circuit breaker or behind your walls, it is best to call the licensed professionals at John Moore to take a look over your breaker problem. Turn off all lights and unplug all appliances in the room or area of the house that lost power. Unplugging your appliances before resetting the breaker will allow you to gradually restore power to the area of your home that lost power. Doing this will also help identify any appliance that may be overloading the circuit. Locate your electrical panel. Electrical panels (aka your breaker box) often reside in storage closets, kitchens, garages, basements or hallways. Sometimes, they can be located on the outside of your house. You can identify your electrical panel by looking for a wall-mounted metal box (that may or may not be flush with the wall) that usually has a small door on it. When you open that small door, you will see all your breaker switches. Identify the breaker that is out of place and/or positioned differently than the rest. Sometimes this will be easier if your breakers are labeled with what section of the house they power. Turn the breaker to the full OFF position, then restore to the ON position. Check the condition of your breaker box. After several resets, breakers will eventually wear out and need to be replaced, so if you find that your breaker switch is no longer working, or that your breaker box is just generally worn out with discolored wires and cracked switches, call John Moore for a routine electrical panel maintenance servicing. Check if your electrical panel uses fuses. Homes with older electrical panels use fuses that have one use, after which they burn out once they are tripped. Unplug each of your fuses to see if any have melted metal inside, or if the glass had become discolored. Replace any melted or discolored fuses. Consider upgrading your electrical panel to one with a breaker system if your home still has a fuse box system, as breaker systems are safer and easier to maintain. Why Does My Appliance Keep Tripping the Breaker? Do you have a certain breaker that just keeps tripping? When you encounter a repeatedly tripped breaker, this means that that breaker is undergoing a continuous overload, which is your electrical system protecting itself from appliances that are pulling too much energy. On sub breaker continually tripping may mean that you have too many appliances plugged into that circuit, or you have an appliance or two that simply requires more power than your circuit can handle. 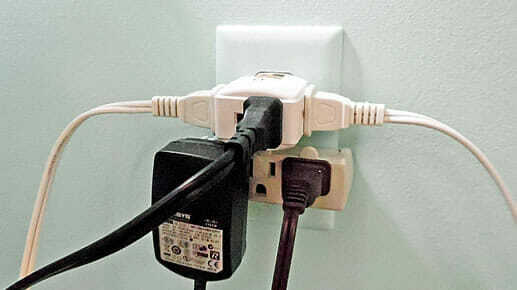 To remedy a repeatedly tripped breaker, start by adjusting the distribution of appliances you have plugged in. For instance, if you have toaster oven, a toaster, a roaster, rick cooker, and a coffee brewer all plugged into power strips that are running from two outlets in your kitchen, you might want to find a new home for some of these devices to another area of your home to prevent an overloaded circuit. Move your coffee brewer and toaster to the breakfast nook; transfer your rice cooker closer to your dining room area. If it turns out you have an appliance that is pulling too much power, consider moving it to an outlet that has its own breaker circuit. Sometimes, moving around the power source for your appliances doesn’t quite do the trick. If overall, you seem to be running into trouble with regularly tripped breakers, it might be time to consider upgrading your electrical system. Does your electrical system need an upgrade because of repeatedly tripped breakers? The licensed professional electricians at John Moore can do just that for you. Perhaps you need to add a new circuit to your breaker box to accomodate your new, high-powered dishwasher. John Moore’s electricians can assist with that. Maybe each of your circuits is running off too low of a voltage stream, or you still have a 2-pronged system that has misdirected grounds: John Moore can help you out with a whole home rewire or GFCI outlet upgrades. At John Moore, we prioritize safe practices when it comes to home services. Regardless of whether you call a professional or tackle a minor issue yourself, safety should always come first. When it comes to electrical problems, there is a high risk that someone can get hurt if things aren’t handled properly. Although, breaker trips are not uncommon and can often be handled by homeowners as long as the proper safety measures are taken. Nonetheless, if you have a repeatedly tripped breaker, you might have a bigger issue at hand and it could be time to call out the professionals. If this is the case for you, give John Moore a call today and we will send out a licensed electrician to inspect your home’s electrical system and set any loose wires and malfunctioning circuits straight. Give us a call at (713) 730-2525 or contact us online today at (713) 730-2525 or contact us online!